Well, there's this elephant named Ebony wearing a huge overcoat who walks and talks like a man, and this cute little girl with a bunny rabbit backpack named Savannah who wants to be his girlfriend. Yeah, I know what you're thinking: do we really need another cute little anthropomorphic comic book?! You know--Bugs Bunny, Uncle Scrooge, Sylvester and that "I tot I taw a puddy tat" little bird--funny talking animals? 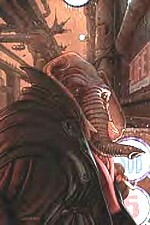 So the elephant and little girl are waiting on a sidewalk at night in 2259 AD in front of a Hooters restaurant, and Ebony in having flashbacks as it begins to rain. You see, Ebony is a human-animal hybrid, born of a human mother (that must have hurt!) and created by a scientist for only one reason, to kill. Even though this first issue just hints at future plots, it should be obvious that Elephantmen is not your typical funny animal title. After all, it is a very dark night. Ebony's flashbacks are unpleasant, and Savannah's mother is horrified when she catches her daughter talking to a "monster". The cute but realistic dialog also plays in contrast to brooding, dynamic art that will knock your socks off. Yeah, it's all here, bud. Intriguing writing and distinctive art both fulfill the technical aspects of good graphic storytelling and lay the groundwork for an excellent new comics title. But excellent comics are about more than competent work. Great comics storytelling is about a unique vision that grabs your attention and wont let go. It doesn't really matter if it grabs you because of talking elephants or super-humans in spandex tights, so get rid of your funny animal prejudice.